Northern Tablelands MP Adam Marshall met with Macintyre Warriors Rugby League Football Club President Peter Rice at the football ground in Boggabilla recently. BOGGABILLA’s newly formed rugby league club, the Macintyre Warriors, has received a very welcome boost on the eve of the football season with Northern Tablelands Adam Marshall MP today announcing a $5,500 grant to purchase a storage container for the club’s equipment. Premier Mike Baird approved the funding after being approached by Mr Marshall with the request for assistance. 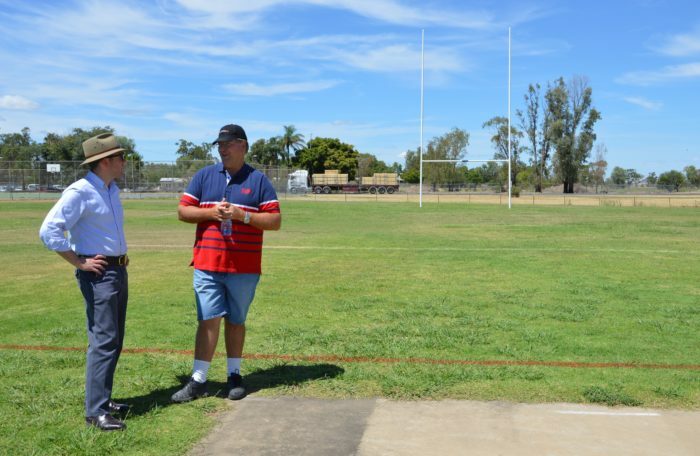 The local MP visited Boggabilla earlier in the month to meet Macintyre Warriors Club President Peter Rice and discuss plans for the future development of the town’s football ground. “The club will be using the old Boggabilla football ground for their home games and training; they are in reasonable order and the Moree Plains Shire Council will assist with the grounds maintenance and upkeep. “The council has also chipped in with a $3,000 grant to help the club purchase training equipment and jerseys thus their urgent need for a container. Mr Marshall said the club has been accepted into the Group 19 competition and at the moment had an A grade team and a ladies league tag side. “They will be playing in a preseason round robin competition this weekend in Ashford and the competition proper begins the week after Easter,” he said. Macintyre Warriors Rugby League Football Club President Peter Rice said it was a great start for the club and they appreciated receiving this financial support. “The container will serve a dual purpose, it will store all our training gear and on match days in Boggabilla we will turn it into a little canteen to sell a few refreshments,” Mr Rice said. “The container doors will open from the sides and we’ll place a little gazebo out the front.